A double theatre is built with auditoriums consisting of several rows of seats on both sides of a big screen (3 x 4 m) framed in red velvet. 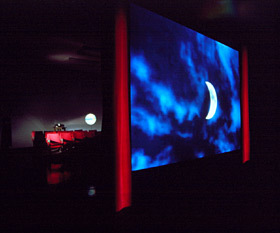 The screen serves as a surface for two simultaneous video projections from the opposite sides. Image from projector A shows the slow movement of the Full Moon across the black background. In front of that side of the screen a sphere/globe is suspended. The image from projector B shows the moving clouds on the night sky. These two images are shown on the screen as one - the Moon on the slightly cloudy night. As the Moon moves across the dark background toward the centre of the screen the globe in front of it becomes the obstacle to the projection. The Moon slowly disappears in the shadow of the globe (its image now being projected on the sphere surface of the globe), but the next moment it starts reappearing on the other side. A visitor can choose from which auditorium he/she wants to observe the eclipse. Side A shows the process, side B the effect, including the shadow image of the same viewer within the picture composition.